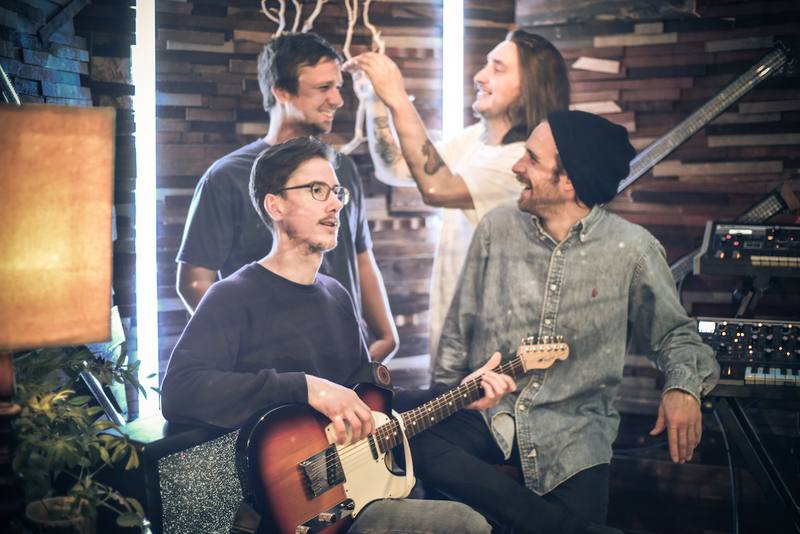 Vancouver’s indie rock collective GOODWOOD ATOMS – expertly comprised of Francis Hooper (vocals, guitar), Joey Pooley (bass, vocals), Dawson Verboven (guitar, FX), and Justin Banmann (drums) – is releasing their brand new self-titled EP today, and Impose has your first listen. A six track wonder – though one of those tracks isn’t available in the U.S. -, Goodwood Atoms is like stepping into a beautiful, kaleidoscope universe of sound. From first track “Tropic Chill”, there is an established, relaxed mood the the EP. (I mean, you read the title of the track, right?) “Wonder” comes off instrumentally as intense elevator music until the vocals hit, and then the beat takes over and you feel your hips swaying like you’re dancing in a club on a tropical vacation. That’s the way this music makes you feel. It’s enigmatic, entrancing, and absolutely a necessity for the coming warmer months. Keep up with GOODWOOD ATOMS here.